We depend on our community for feedback and like to hear from all our users. One way to let us know what you think is by commenting on blog posts published on vivaldi.com. Here’s what you need to know about that. To comment on Vivaldi posts (Team blog and Snapshot), you first need to have a Vivaldi account. Scroll down to the end of the post and click on Login if you already have an account, or on Register if you need to sign up for one. Once logged in, you’ll find yourself on the Forum. You can scroll down to Announcements/Team blog or Announcements/Snapshots and find the blog post you want to comment on. Or you can navigate back to News at the top of the page and then Team Blog or Snapshots. If it appears that you are still not logged in under the blog post, first try refreshing the page. If this doesn’t help, check if you have third-party Cookies blocked. Because comments are stored on vivaldi.net and blog posts on vivaldi.com, you need to enable vivaldi.net’s cookies on vivaldi.com in order to comment. To enable all third-party cookies, go to Settings > Privacy > Cookies and uncheck the box for Block Third-Party Cookies. If you do not wish to do that, you can whitelist specific pages. While you’re on the blog post page, access the Site Info menu by clicking on the lock icon (on the left side of the address field). 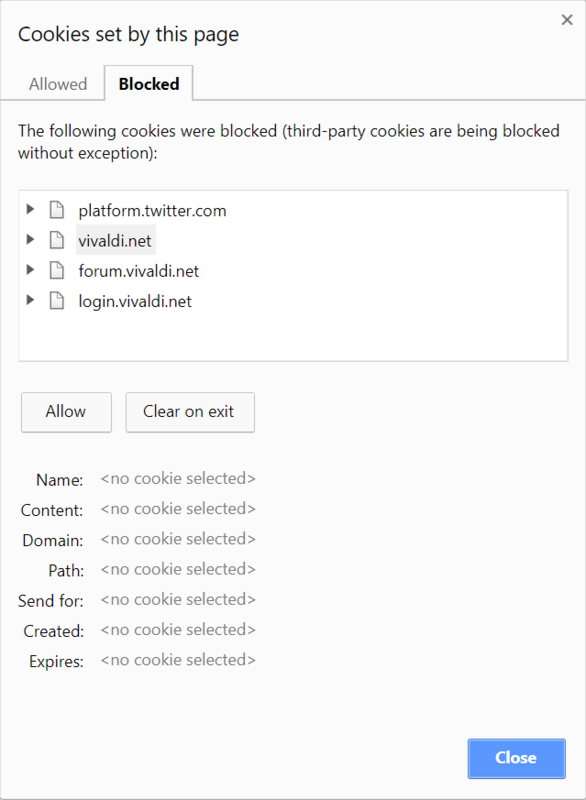 Select Cookies and move all Vivaldi cookies from the Blocked list to the Allowed list. Close the settings window and refresh the page. If you’re using an extension to block cookies, whitelist Vivaldi in the extension.